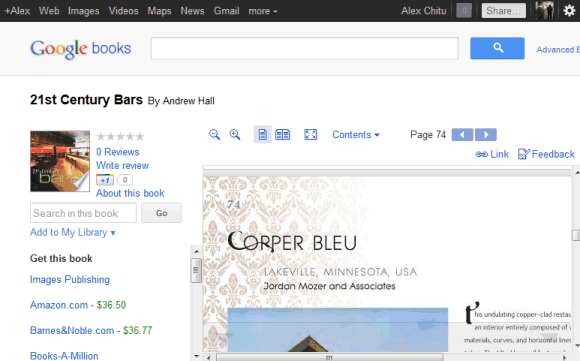 The Google Books website received a new interface this week, and I think it's going to be a big improvement in usability. They're saying that it's cleaner and more consistent (with other Google sites), and it is. It also uses more white space to separate the various components, but that unfortunately leaves less room for books. On the other hand, I'd say that the new design is easier to use on the iPad. The extra does help make it easier to click on just the link I'm aiming at. BTW, the new design won't have any effect on mobile visitors; they're redirected to the mobile site and it hadn't been changed yet. I don’t see any great improvement in it. And why does your snap say Alex somebody? That’s one of the other new features in Google. i think you an get your name up there if you fill in your profile. Yeah, but it’s not YOUR name, is it? Whoops. It seems I didn’t link to the source.